In latest diplomatic move against Israel, and as Arab terror attacks continue to target Jews, PA to ask UN to deploy troops in Jerusalem. The Palestinian Authority wants the United Nations to consider deploying military "protection force" in Jerusalem to help quell violence, the PA envoy to the United Nations said Wednesday. The proposal would be included in a draft resolution aimed at defusing weeks of violence, largely consisting of a series of brutal Arab-on-Jew terrorist attacks, which many fear could still spiral further out of control. 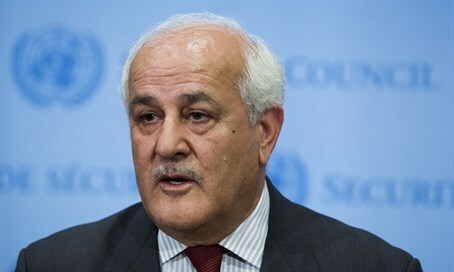 Palestinian envoy Riyad Mansour told reporters that the situation was "very explosive" and that the Security Council must find ways of "providing protection" to the Palestinians. "The situation warrants providing protection for our people in the occupied territory starting in the Old City of Jerusalem and Al-Aqsa mosque," Mansour told reporters. Arab ambassadors are due to meet at the United Nations on Thursday to discuss calls for an emergency Security Council meeting to discuss the worsening violence. Mansour said the Arab countries were weighing a possible draft resolution that demands a withdrawal of Israeli security forces from flashpoint areas and calls for the deployment of the protection force at "Al-Aqsa," referring to the entire Temple Mount, which is Judaism's holiest site but in recent decades has been claimed by Palestinian Arabs. "We believe that some form of observers or international force (should) be placed there in order to guarantee that the status quo will be continued and to protect the Palestinian worshippers," said Mansour. Prospects for such a measure, however, were uncertain. The United States has condemned attacks on Israeli civilians and called for a return to calm. The Palestinian envoy said the UN office of legal affairs had produced a 44-page report detailing options for the "protection" of Palestinians, but that the Security Council had yet to consult it. Israeli security force have set up checkpoints Wednesday in Arab neighborhoods of Jerusalem and mobilized hundreds of soldiers as it struggled to stop attacks. Mansour called the checkpoints "collective punishment" and said 30 Palestinians have been killed in the recent violence, including seven children - failing to note that the vast majority were either terrorists killed during attacks or rioters attacking Israeli soldiers.